Boucher acknowledges that some people enjoy those types of photos, and she doesn’t seek to change anyone else’s behavior. She wants to promote the fact that women can ride motorcycles and that there are more today than ever before. 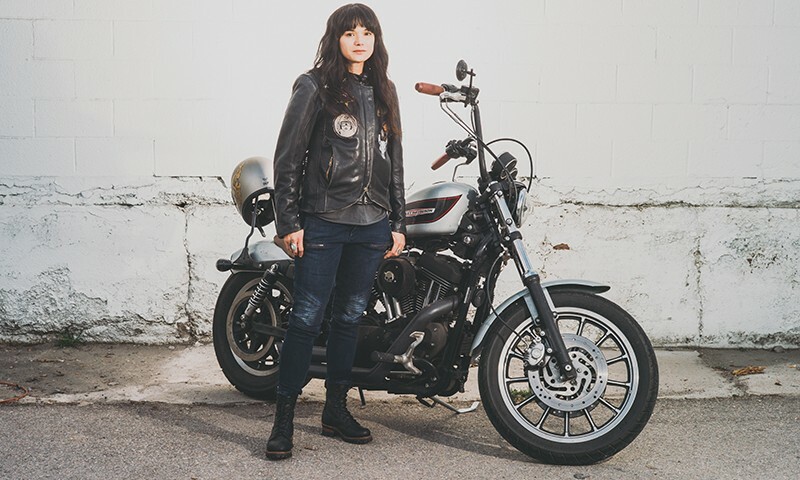 “The women’s motorcycle market is the fastest-growing demographic within the motorcycle community, and I just felt like there needed to be something to support women,” says Boucher. Her frustration eventually turned to action, and she decided to create FFMoto. She had seen other women riders like her on social media—some outside of Salt Lake City—and decided to reach out to them. “I just started to focus on contacting women via Instagram and collecting their stories, finding women artists that are within the community—whether they paint tanks or they do leather craft—or even men that portray women that ride in a positive light,” she says. With an influx of new riders, motorcycle culture has undergone many changes in the past few years. Boucher acknowledges that some people are hesitant to accept new female riders. “There’s been quite a bit of hate or degradation towards women that ride,” says Boucher. “Men usually never really have to deal with that. They say things like either we’re not smart enough or not strong enough to handle a motorcycle—or it’s just a trend.” The reality is that there are likely more women riders than in the past. 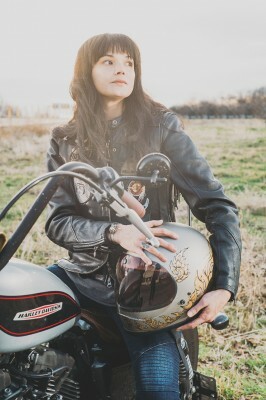 Boucher is not the only woman seeking to encourage women who own and ride motorcycles. Local motorcycle collective The Litas was founded in Salt Lake City and has since spread worldwide with groups in 12 countries and 55 cities. 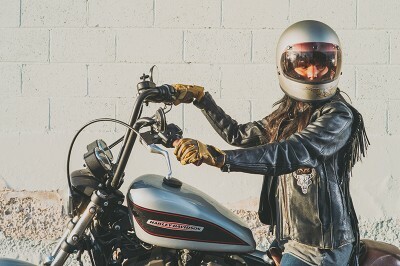 One of Boucher’s personal contributions to the movement is dedicating a section of her website to showcasing individual women riders and highlighting the many diverse stories and backgrounds of women motorcyclists in Utah and beyond. For instance, Boucher featured local rider Felicia Baca. 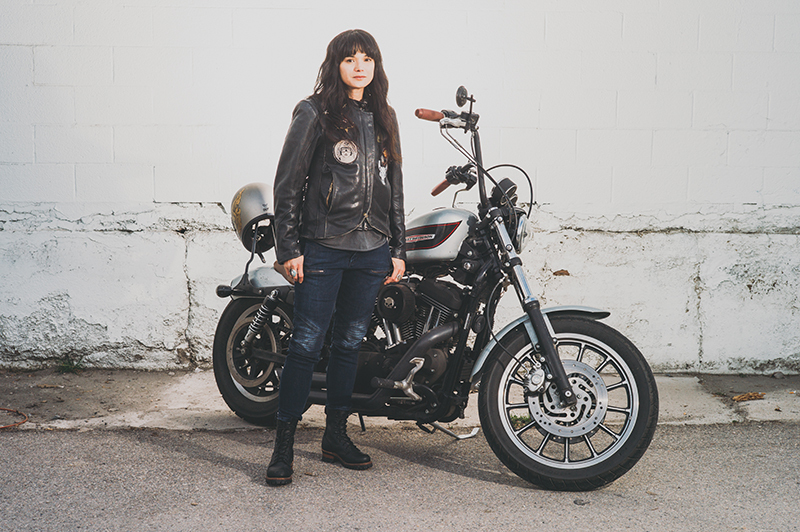 Readers might have seen Baca playing bass for local band Color Animal, but might be unaware that she rides a black Bonneville and has been riding for 12 years. Also featured was local Riley Ridd, who rode countless miles through the Baja California Peninsula and can be seen riding locally on her Enduro adventure bike. In addition to running her website, Boucher works as a wardrobe stylist in the fashion and movie industries. Her studio is filled with fascinating handmade outfits and costumes, including medieval knight’s armor and what looks like something that Edward Scissorhand’s girlfriend might wear on a night out. “I’ve been doing styling and custom design for about 12 years, and I still do it on occasion—I’m just really choosy with what I do,” says Boucher. She started FFMoto with the intention of designing riding apparel especially for women, though she has put that on the backburner for the time being—more than one to-be-continued, motorcycle-inspired piece, however, can be espied on mannequins in her studio, which is located near Publik Coffee Roasters.